1/23/14 edit: The route on mapmyride.com has been put on private until we can pre-ride and update two changes on it. You can still see the zoomed out map here to get the general idea. Changes will probably make it shorter, but increase the percentage of dirt on it it, so Lob taketh and Lob giveth back. This just in: The tentative route is up and can be viewed here on map my ride. As you can see, the ride is on readily accessable roads and trails. All I've done is stitch them together in order to link some of the best riding in the area. The actual route that will be used on the 15th is subject to change, although will be close to this published one. A team of tireless volunteers is pre-riding it constantly in order to make sure there are no access issues. There is some construction that the state water project is doing out by the Santa Ana River that we're particularly keeping our eyes on. This is 90-93 km (56-58 mile) into the ride as you're looking at the map. Would hate to have to cut that portion out, but it would be the only known problem we can't work around. There is also a short hike around a gate and a bridge that we want to make sure is passable in the Riverside nature preserve. 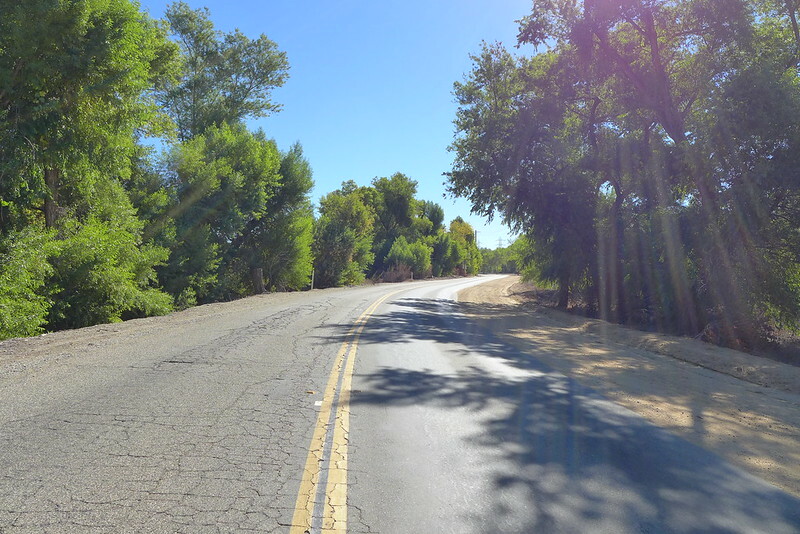 That is at the 31mile/50km mark as you leave San Timoteo Canyon Rd and go onto Woodhouse Rd. It's the only part that may feel sketchy, but I looked all over for private property/no trespass signs, and just came up w/ no hunting, no motorized vehicle, road not maintained by county. Sort of an invitation for an awesome ride if you ask me! Take some time and get a feel for the route. Look at it in the satellite view so you can see what's dirt and what isn't. This is self-supported so we're not going to have route markers, sag vehicle, or sweepers planned. The map link will stay active, so you can use it in real-time on the ride as well with your personal electronic devices. Everyone is encouraged to pre-ride any or all of it over the next few months to get an idea of what to expect. Rain would be the only concern, as we'll have to figure out what to do if it really pours. A little rain is fine, even nice to be honest with you, but a downpour would really saturate the dirt and we would leave it quite rutted. There will be some sandy sections, but they're pretty short (5 meters or so each) and not terribly deep. Most all of the dirt will be hard pack or light sand over hard pack, and pretty smooth without rocks or ruts. A few km of climbing up smooth ~8% grade singletrack. But remember, 50km or half of the route will also be on the tarmac. So, all that said, I think a 30-40mm tire with minimal to no knobs would be perfect. Something that won't drag on the road (1/2 the ride) yet will let you float on the dirt. 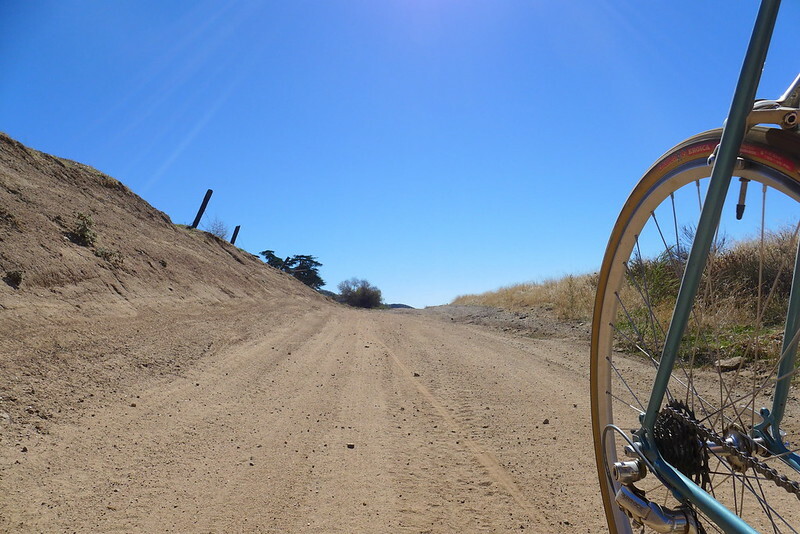 I wouldn't drag around a heavy agrgessive tire for the few km of rocky or sandy sections. 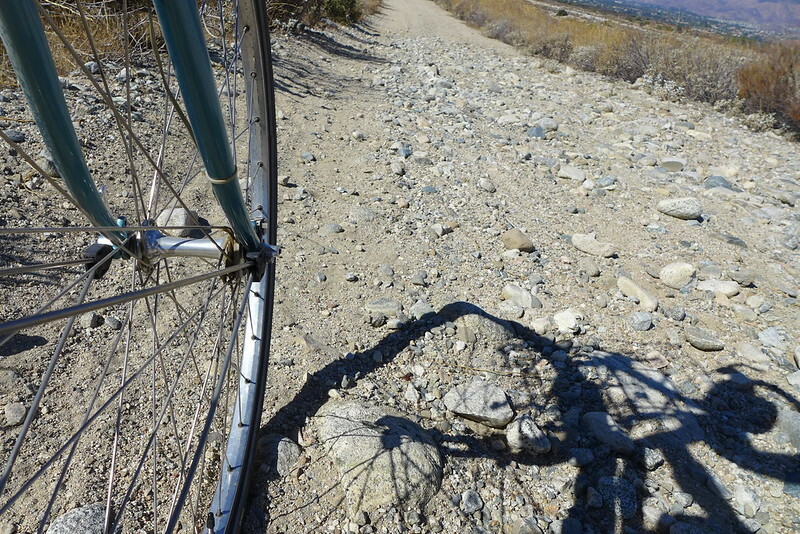 That said, a 28mm or narrower road tire could make those same rocky or sandy sections pretty unpleasant. But if that's how you roll, nobody here with think less of you! Friends of mine have rode this with 23mm tires and lived to tell the tale!!! The last consideration is the potential for goathead punctures throughout the ride. Really no way around that. Stay out of the gutter/shoulder of the road. You either run over them or you don't. The only sure method is tubeless, and if you have those set up, go for it. But not something to worry about. In 650B, Grand Bois Hetres might be close to perfect for the ride, although they may slip out a bit on the singletrack climb. But for the other 98% of the ride, they will be great! SOMA's C-Line should do really well, with the same positives and negatives in the 700C size. Really though, this is a "run whatcha' brung" ride. Don't stress out on it too much, spend more time figuring out how to get out here for the day and join us! 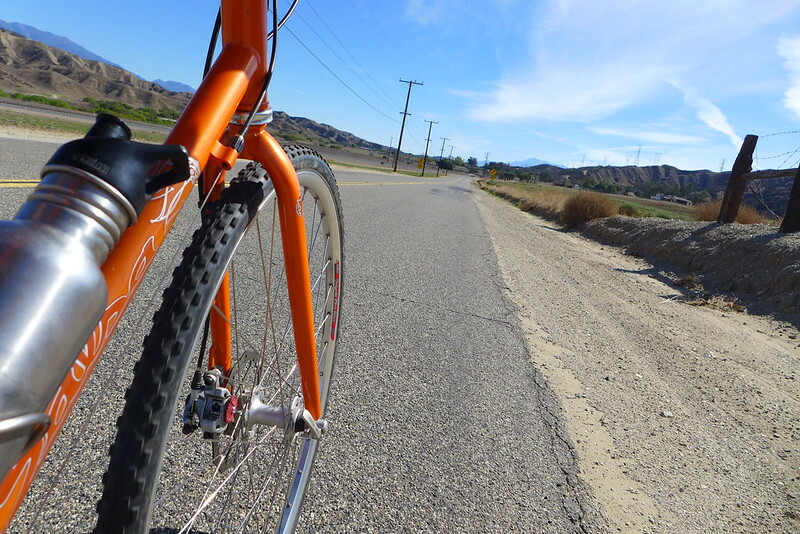 If you love the idea of mixed-surface rides in Southern California, but the Redlands Strada Rossa is just too short for you, mark your calendar for March 22nd! In San Diego County, the Palomar Puzzler 150 is going to be on the Saturday following the RSR ride. I'm excited to see this ride, and am thankful we didn't settle on the same date!!! Doing the 65 miles in Redlands would be a GREAT way to prepare for the 150 (really 180+) the next week! Dial in your bike, stretch those legs out, figure out some nutrition. Everything you need to do! This is not a race where you earn points and have your time posted. This is not a randonnée with a card you have to check off. This is not something you paid money for. This is not something you're getting paid for. This is a long ride, and there is a LOT of climbing on it... over 4,300 feet according to the internets! So if you have to turn off the course and head back to town, to home, to the airport, do it! The minute you stop having fun, then it's time to figure out a way to get it started again. If that means getting an early start on the post-ride festivities, have at it!!! There are going to be some strategically placed volunteers on the course that will be able to help out, but don't count on that. 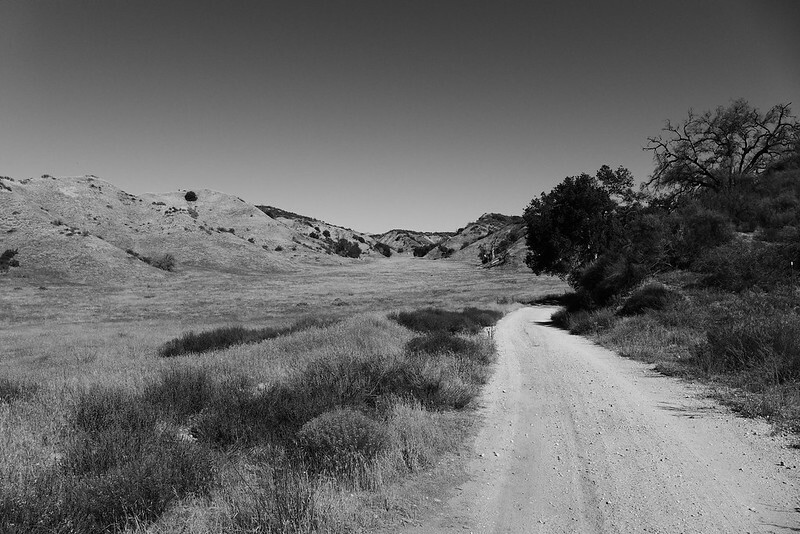 Bring a map, digital or paper, that shows you the different roads back to Redlands and the start. Every route back will have some positives and negatives, so best to plan out some options ahead of time. Feel free to ask questions here and get some alternative routing info while you can! This is multi-surface ride, so there will be plenty of roads to wind down. 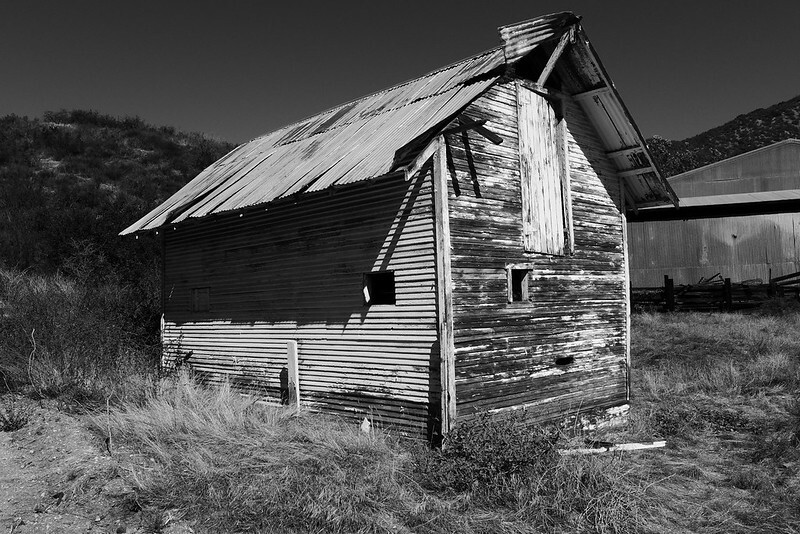 Not all will be as lovely as the one above, but I've endeavored to use as many rural back-roads as possible. About half the route is on dirt, so the other 50km will be asphalt! There will be a little bit of singletrack, a photo by cyclotourist on Flickr. Woodhouse and Wildwood are two of my favorite places to ride. 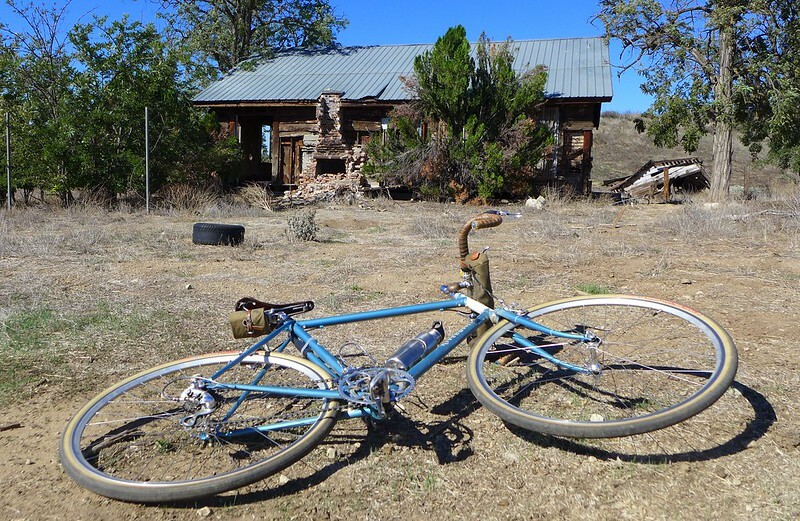 Dirt roads, abandoned buildings, views for miles, and no cars! What's there not to like??? The loop with just those two sections is about 36 miles/half the route, so this shows a pretty good idea what's in store! 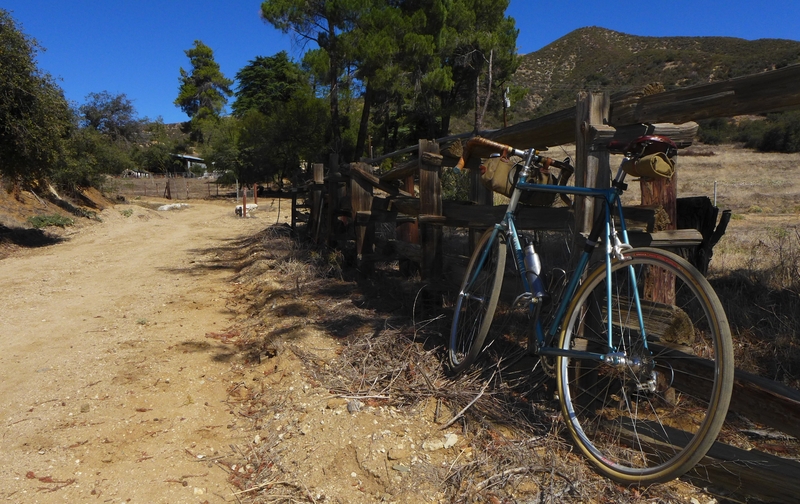 Redlands Strada Rossa Ride, a group on Flickr. Photos along the proposed 100km route. Highlighting the 46km of dirt the route provides. If this doesn't get you motivated, nothing will! March 15th ---- Save that Date!!! It's official! Working around a very busy March calendar, leaves Saturday the 15th as the freest day of the month. Inland Southern California is absolutely beautiful in March, and temps will be in the 60's to 70's. Small chance of rain, but I think this will be a rain or shine event... y'all have mudguards, right! So mark it in ink! 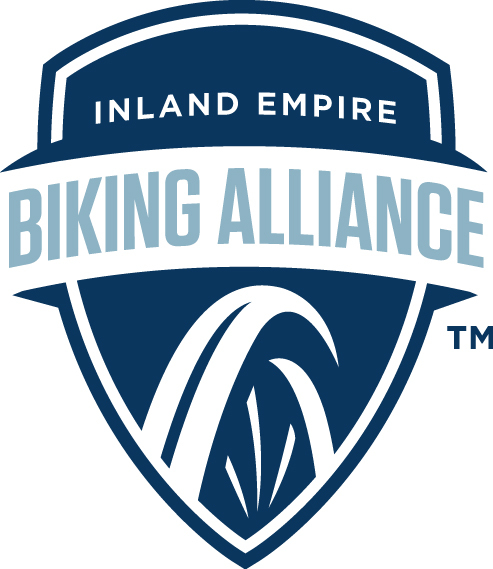 If all goes according to plan, there will be a 100k mixed terrain ride starting and ending in Redlands in Spring 2014. 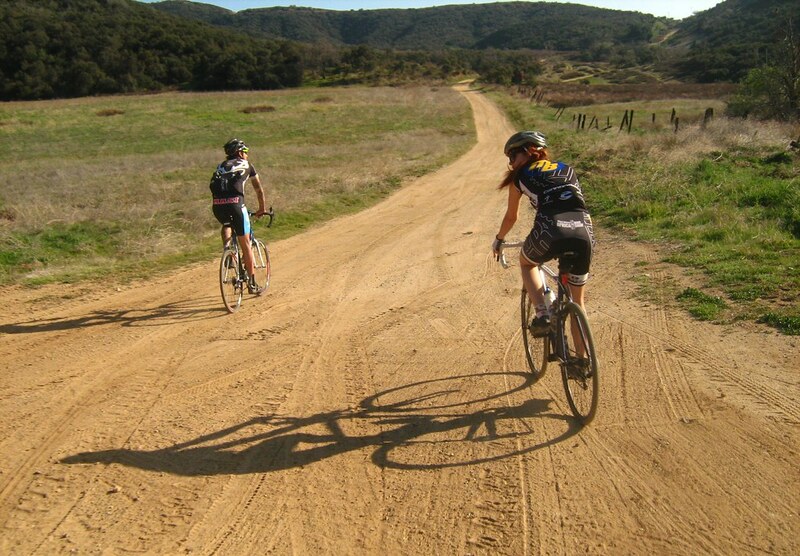 We're aiming for 40-50% of the miles being on dirt! 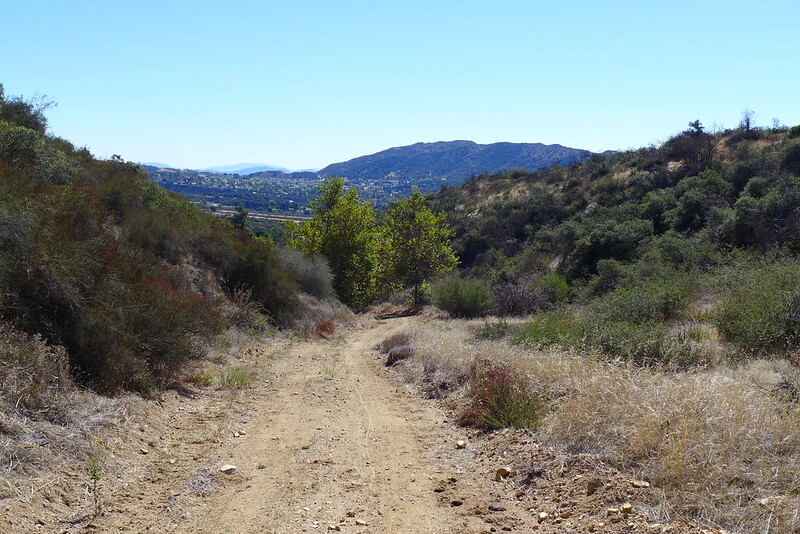 There are some fantastic back roads here eastern Inland Empire that most people don't know exist, and this will be an opportunity to explore the area. The route will be on public roads, through several land conservancies, and a state park. It is unsupported, meaning that pubic roads are open to vehicles. Riders need to be self sufficient and responsible for their mechanical and nutritional needs. What we'll do is provide you with a fantastic cue sheet charting a great route, and scrounge up some good grub for you at the end. Can't imagine a better time!